Tanzanite Crystal Dimensions: 0.4" long x 0.3"x 0.2"
This naturally terminated tanzanite crystal was mined in the Merelani Hills of Tanzania. It is semi-transparent to transparent. The prismatic faces and the terminations are in mostly good conditon with some abraded areas, and they have vitreous luster. This naturally terminated tanzanite crystal was carefully heated and it has strong purplish color in one direction with strong blue color perpendicular to the purple. See also a view of this tanzanite crystal lying down on its side. This natural color (Zoisite) crystal was stated by our supplier to have been mined in the Nangarhar Provence of Afghanistan. It actually is two crystals that are inter-grown and they are also doubly terminated. They grade from semi transparent at the base to completely transparent gem-grade at their teminations. Its prismatic faces and the terminations have vitreous luster, are in very good condition. This natural color tanzanite crystal has weak dichroism with a very light greenish blue gray color in one direction and a light pinkish gray when viewed from the front as shown in the photo at left which was taken under a mixture of incandescent and flourescent light. See a back-view photo of this zoisite crystal. The crystal morphology of this specimen is very nice as well. This small size natural tanzanite crystal was mined in the Merelani Hills of Tanzania. 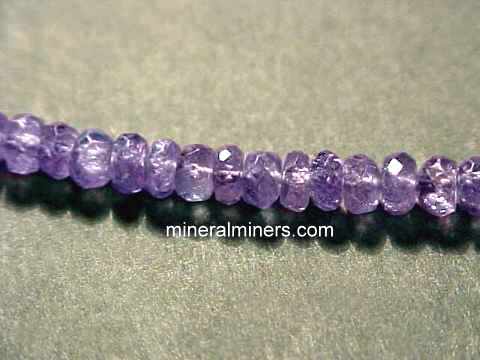 It is an unheated lightly included tanzanite crystal. This unheated tanzanite crystal would be considered cuttable with a good sized clean area. It is a single crystal with mostly nice faces and terminations. This specimen is heat treatable but has a unique bi-color look as is, with a slightly blueish base and transparent greenish yellow termination. See also another view of this unheated tanzanite crystal. See also another view with transmitted light of this unheated tanzanite crystal. This natural tanzanite crystal was mined in the Merelani Hills of Tanzania. 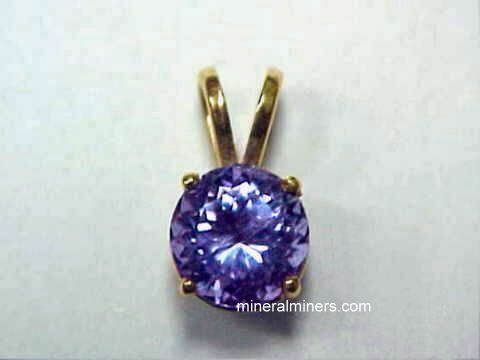 This unheated, lightly included tanzanite crystal would be considered cuttable, with a good sized clean area. The intergrown side by side crystals are somewhat striated but the terminations are in good condition. This specimen is heat treatable. It has a pale brownish greenish yellow look as is. See a side-view of this unheated tanzanite crystal. See also another view of this natural color tanzanite crystal. Tanzanite Crystal Dimensions: 0.7" long x 0.4"x 0.3"
This naturally terminated tanzanite crystal was mined in the Merelani Hills of Tanzania. It is semi-transparent to transparent. The prismatic faces and the terminations are in mostly good conditon with some abraded areas, and they have vitreous luster. This naturally terminated tanzanite crystal has a gem grade area at its tip that would yield a one carat faceted gemstone. See also a view showing this gem grade tanzanite crystal lying on its side. Tanzanite Crystal Dimensions: 1.4" long x 0.7"x 0.5"
This naturally terminated tanzanite crystal was mined in the Merelani Hills of Tanzania. See also a full view of this tanzanite crystal. It is semi-transparent to transparent. 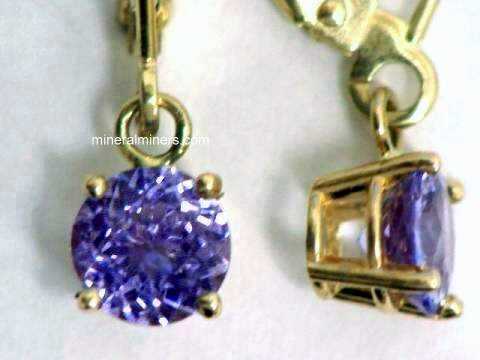 See a back view photo of this tanzanite crystal. The terminations are in very good conditon overall, and they have vitreous luster. This naturally terminated tanzanite crystal has some small gem grade areas at its tip. It was carefully heated and has a very rich purple color in one direction and rich blue color perpendicular to the purple. See another view showing the amazing color of this genuine tanzanite crystal. This is the end of our Tanzanite Lapidary Rough virtual gallery page. 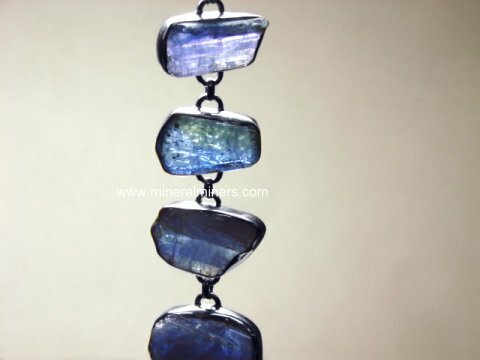 See also our pages displaying Tanzanite Jewelry, tanzanite bracelets, Tanzanite crystals and Mineral Specimens, and our Tanzanite Earrings in sterling silver and 14k gold. To see more Tanzanite photos, just select another item category from the table below. To see photos of another mineral variety, select any item category link in our Mineral Inventory & Factsheet Index. 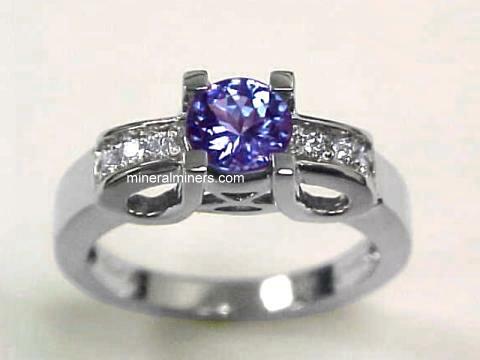 Would you like us to inform you when we add on this page more genuine tanzanite pieces suitable for lapidary use? We do have additional inventory of genuine tanzanite items in stock, so be sure to let us know if you have any tanzanite lapidary rough special requests. Please contact our webmaster or our 'site' geologist with any questions or comments.